Mary Poppins runs through December 31 at Virginia Rep’s November Theatre. Jack Hensley, Stacey Cabaj, and Anya Rothman. Photo by Aaron Sutten. 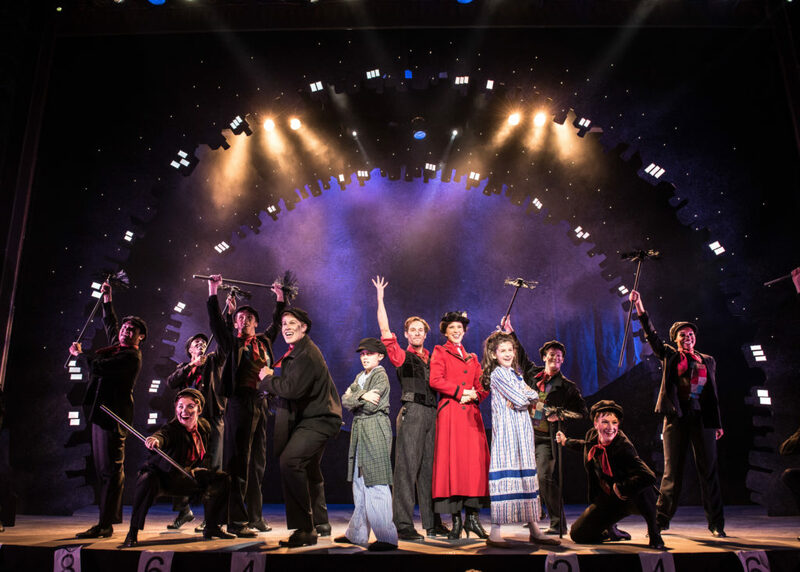 Even though I never thought of Mary Poppins as a holiday show, Virginia Rep’s current production of the beloved musical is adding its own magic to an already magical season. It will definitely fly away with your heart (pun intended)! For those not familiar with Mary Poppins, the story involves a practically perfect nanny that comes to help out the Banks family, which desperately needs help on many fronts. The kids are out of control and their parents, especially the father, are dealing with issues of their own. When Mary is hired as the nanny to young Jane and Michael, out-of-the-ordinary things start to happen, reinforcing the fact that Mary is not your typical nanny. The children have lessons to learn, and Mary and her friend, Bert, are there to teach them albeit in an unusual way. But it’s not just the children she helps. The whole family benefits from Mary’s bewitching insight. Virginia Rep always sets the bar high when it comes to holiday productions and this year is no exception. Director Chase Kniffen has done an outstanding job of putting together an extremely talented cast that exemplifies the show’s hopeful message of love and family. His collaborative directing style showcases the actors’ strengths and talents. John Moon and Andrea Rivette who play George and Winifred Banks provide strong performances that detail the couple’s struggles with open dialogue and parental responsibilities. Anya Rothman and Jack Hensley are quite adorable as young Jane and Michael Banks. Their enthusiasm lights up their performances. Debra Wagoner, who plays several roles, is hilarious as the sinister Miss Andrew, George’s nanny when he was a youngster. She definitely knows how to win over an audience. Robyn O’Neill’s honest performance as the Bird Woman is both heartwarming and heartbreaking. She captures the woman’s vulnerability and compassion perfectly. Morgan Reynolds who plays Bert, Mary Poppins friend, and Stacey Cabaj who takes on the role of Mary Poppins, turn in stellar performances that literally soar to glorious heights. Reynolds whisks around the stage with a lightness that is contagious. Every movement and glance has the feel of being spontaneous and authentic. He’s a joy to watch. Cabaj nails the “practically perfect” side of Mary Poppins advancing it to perfect in every sense. Her voice is heavenly and always spot-on. And Mary Poppins is indeed a holiday favorite thanks to its message of family, hope, and togetherness. This is definitely a production the entire family should see. Recommended for five and up if your younger kids can handle two hours and forty minutes of musical entertainment. 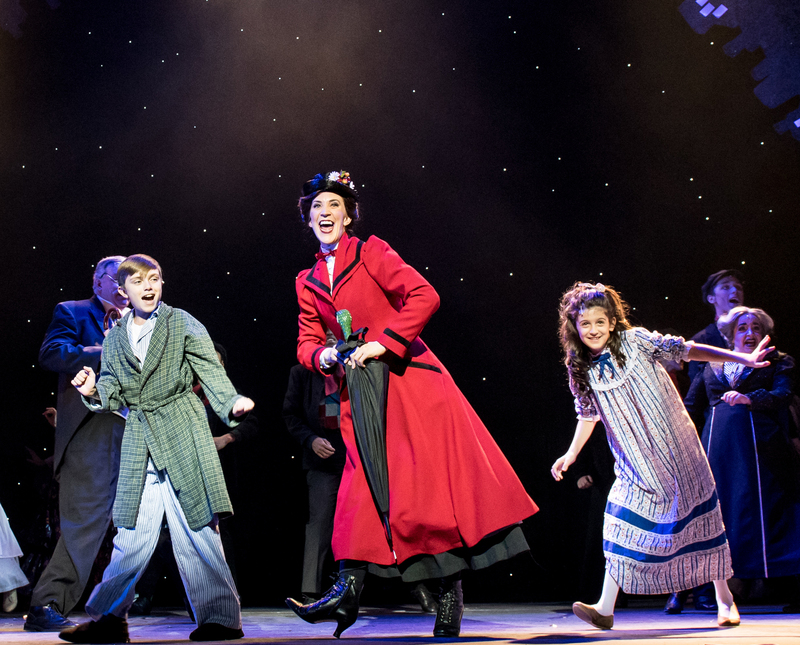 Mary Poppins has been extended through January 7 at Virginia Rep’s November Theatre. Visit Virginia Rep for showtimes and tickets. Jack Hensley, Morgan Reynolds, Stacey Cabaj, and Anya Rothman at center. Photo by Aaron Sutten.